* Click the product picture to be taken to the category for that item. 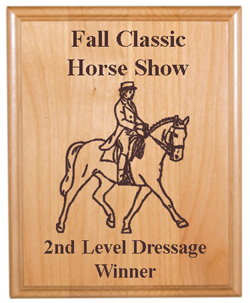 Genuine alder wood plaque that is laser engraved with horse show award information and our Dressage horse design. Many sizes and styles to choose form. Makes a great award or gift. 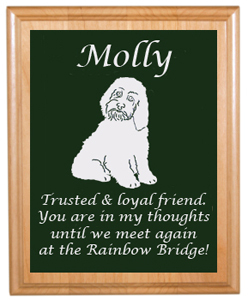 Genuine alder wood pet memorial plaque. 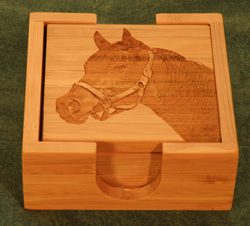 Comes with up to 6 lines of engraving and a dog design, horse design, horse breed logo or custom engraved photo. Many sizes and styles. 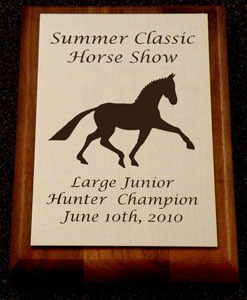 Bamboo plaque that is laser engraved with horse show award information and our Jumping horse design. 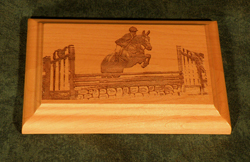 Makes a great horse show award or equestrian gift. Bamboo the green alternative! Piano finish floating acrylic plaques come in two sizes and two colors. Your text and the design you choose are engraved on the acrylic plate that is mounted with studs to elevate the plate. 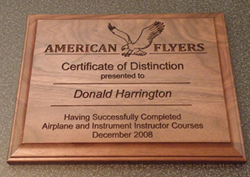 Genuine walnut wood plaque with attached metal plate. 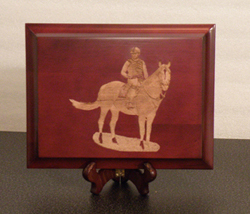 The metal plate can be engraved with a horse design, breed logo or personal photo. Makes a great horse show award or sign. Many plate colors and plaque sizes to choose from. Genuine walnut wood plaque with attached metal plate. 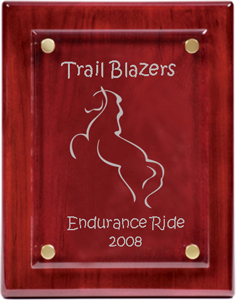 The metal plate can be engraved with a horse design, breed logo or personal photo. Makes a great horse show award or sign. Many plate colors and plaque sizes to choose from. Genuine red Alder wood plaque with attached metal plate. 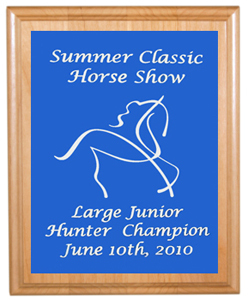 The metal plate can be engraved with a horse design, breed logo or personal photo. Makes a great horse show award or sign. Many plate colors and plaque sizes to choose from. 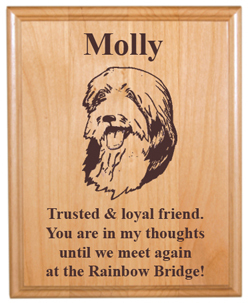 Genuine red Alder wood pet memorial plaque with attached metal plate. 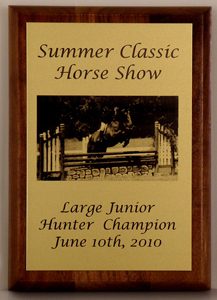 The metal plate can be engraved with a horse design, horse, breed logo, dog design or personal photo. It is a great way to remember your beloved pet. 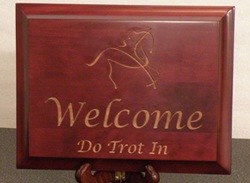 Cherry finish wood sign with engraved horse design and text. 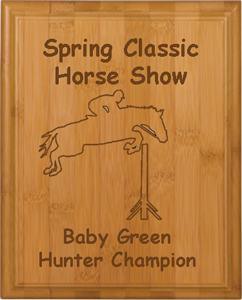 Makes a great horse show award or barn sign. 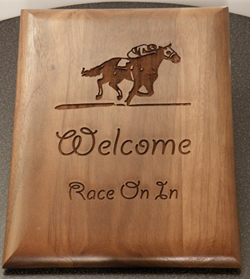 Walnut raised wood sign with engraved horse design and text. Many design to choose from. American walnut wood engraved sign. This sign has the race horse design engraved on it. 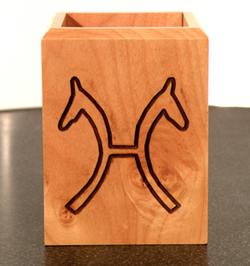 This design can be found in our horse design items. Engraved text is the font Giddy Up. 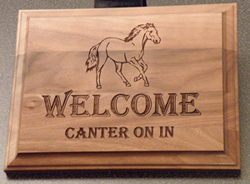 Add your own custom engraved text and choose your favorite horse design or breed logo. Alder wood laser engraved plaque / sign with engraved personal photo. You can also add laser engraved text to these plaques / signs. For more information on custom engraved photos please see our custom engraved image information page. American Walnut laser engraved plaque / sign engraved with a personal photo. You can also add engraved text to these photo engraved plaques. 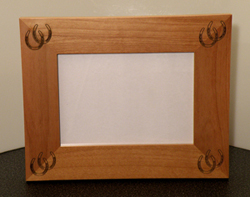 For more information on custom engraved photos please see our custom engraved image information page. 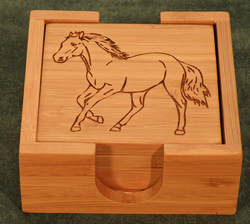 Set of 4 bamboo coasters with the Horse Two design that can be found in our horse 2 items. 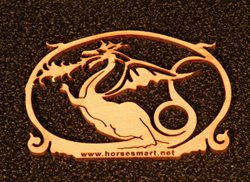 The horse design you choose is laser engraved on all 4 coasters. Text can also be added to each coaster. If you want a different design or different text on each coaster in the set just send us an email for pricing. 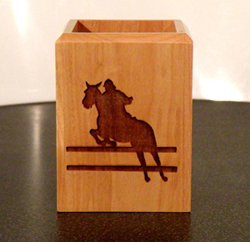 Set of 4 bamboo coasters with the Dutch Warmblood breed logo that can be found in our breed logo items. The breed logo you choose is laser engraved on all 4 coasters. Text can also be added to each coaster. If you want a different design or different text on each coaster in the set just send us an email for pricing. 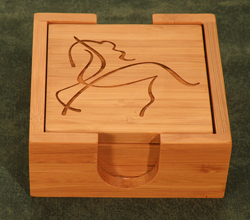 Set of 4 bamboo coasters with the Running Horse design that can be found in our horse design items. 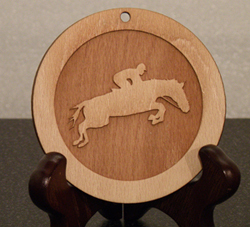 The horse design you choose is laser engraved on all 4 coasters. Text can also be added to each coaster. If you want a different design or different text on each coaster in the set just send us an email for pricing. Set of 4 bamboo coasters with your personal photo engraved on them. The photo is laser engraved on all 4 coasters. For more information on custom engraved photos please see our custom engraved image information page. 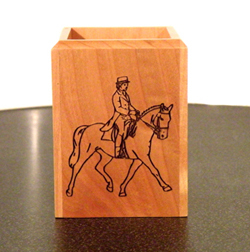 Maple wood pen holder engraved with the German Hanoverian breed logo. You can also add engraved text to these wood pen holders. 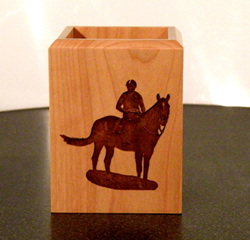 Maple wood business card holder with engraved running horse design. 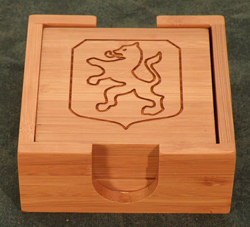 You can also add engraved text to these wood business card holders. 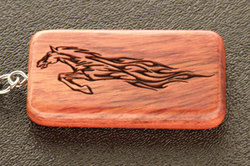 This key chain was engraved rosewood piece. These key chains also come in Maple wood. 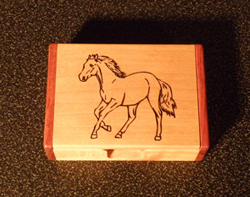 The image can be found in our horse design 2 items. This item was cut our of a sheet of wood and then laser engraved. 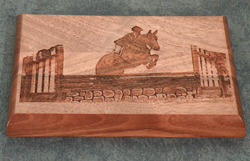 The wood around the jumping horse in the center was engraved out so the jumping horse is raised. We can cut our wood strips in any shape needed. Engraved text can also be added. This item was cut our of a sheet of wood and then laser engraved. We can cut our wood strips in any shape needed. Engraved text can also be added. Cherry finish wood sign or plaque engraved with a custom photo. You can also add engraved text to these plaques / signs. For more information on custom engraved photos please see our custom engraved image information page. Maple wood pen holder engraved with a custom photo. You can also add engraved text to these wood pen holders. For more information on custom engraved photos please see our custom engraved image information page.